Understanding Evolution, its evidences and mechanisms. “Ammonites evolved 400 million years ago and survived for a long time only to become extinct 65.5 million years ago. 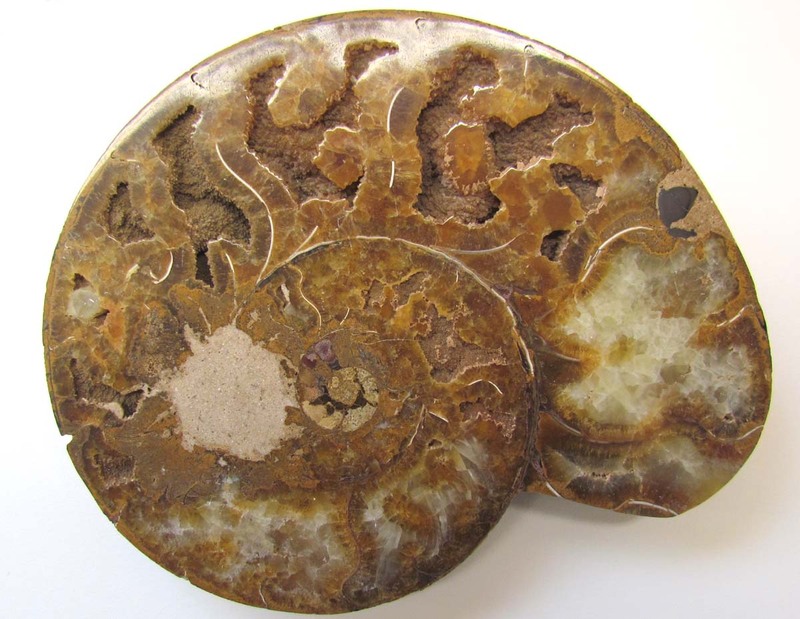 Some ammonites were huge — fossils have been found that are more than six feet in diameter.”–Via The Agatelady. “Recent puzzling observations of tiny variations in nuclear decay rates have led some to question the science of using decay rates to determine the relative ages of rocks and organic materials. Scientists from the National Institute of Standards and Technology (NIST), working with researchers from Purdue University, the University of Tennessee, Oak Ridge National Laboratory and Wabash College, tested the hypothesis that solar radiation might affect the rate at which radioactive elements decay and found no detectable effect.”–Via Radiometric Dating Still Reliable (Again), Research Shows. “An excavation of a seaside cave in South Africa revealed two objects that were clearly manmade—pieces of ocher stone etched with a crisscross pattern. Neither the stones nor the rock in which they were buried were volcanic in origin, though, so the researchers chose another method for determining their age: thermoluminescence. “Ancient Aliens is some of the most noxious sludge in television’s bottomless chum bucket. Actual experts are brought in to deliver sound bites that are twisted and taken out of context while fanatics are given free reign. Fiction is presented as fact, and real scientific research is so grossly misrepresented that I can only conclude that the program is actively lying to viewers. To present the show as a documentary, on a non-fiction network, is a loathsome move by the History Channel spinoff. (Technically, Ancient Aliens airs on an offshoot of the History Channel called H2.) If the network and the show’s creators want to presentAncient Aliens as a light survey of fringe ideas and make it clear that the ideas aren’t meant to be taken seriously, I can’t quarrel with that. But Ancient Aliens and shows like it winnow away at actual scientific understanding by promoting absolute dreck. Ancient Aliens is worse than bad television. The program shows a sheer contempt for science and what we really know about nature.”–Via The Idiocy, Lies and Fabrications of Ancient Aliens. ← The Catholic Church and its views on evolution. What would the present be without evolution? Evolution is defined by the Merriam-Webster dictionary as “a process of change”. Evolution is the force that creates present. We use this word often but we do not know how broad the term is. Evolution covers billion of years of change and improvement. It is impressive how scientist today can find the age of something thousands of year using radiation. The University of Berkeley (UCB) explains biological evolution in few simple words. ‘Evolution’ in the context of what we’ve discussed in class is another way of stating that change happens in function of time. We’ll see that ‘change’ happens at a molecular level. ‘Change’, ‘Evolution’, ‘Mutation’, etc., are all very related concepts. Just as it is present in this post, science and its evidence are widely misunderstood and misinterpreted. In many occasions, scientific findings are given no credit in any matter these days. In my opinion, this occurs due to the fact that fiction interests the public more than fact. Not only that, but some people choose to leave all science behind and only believe and follow religious or moral ideals. Now, don’t get me wrong; I am in no way against any type of religion; I am very Catholic myself. What I am trying to communicate is that many advances and inventions currently making our lives easier and enjoyable are products of scientific findings and research; many people take science and its different branches for granted and decide to rely on what they think is easier to understand and on the majority’s beliefs. It is incredible how scientists have developed such many ways of determining the age of rocks and fossils. Evolution is an amazing natural process and it is even more wonderful getting to understand how it works. It is something that happens everywhere all the time and helps organisms survive all around the world. Every day more and more evidence turns up that supports the theory of evolution and I hope one day we will just agree and people will stop fighting about it. Evolution is the process that explains how living things change over time. Without it we would go extinct because living things must adapt to their environment in order to survive. Its incredible how scientists have been able to know how old a fossil is through processes such as radiometric dating. Fossils and evolution go hand in hand. Fossils prove that evolution occurs, as well as evolution helps understand the different yet similar fossils. On the link below you can see four examples that support evolution that have been found through fossils. Indeed. The fossil record has been crucial in understanding how natural selection works. Evolution isn’t only the change through time but also progress is made and new invensions are developed. As we can see in the video scientists have developed a system to discover the age of a fossil. The system of calculating there half-life is used with fossils ase old as 60,000 years old. This amazes me because in different ways this can help find cures or it can help invent new races or species that haven’t yet been discovered. In the link below you can see the history of evolution. Evolution is proven scientifically in many ways, thanks to this discovery scientists can know where we came from and how different species came to be and what their ancestors looked like. Carbon dating is very important because without it we wouldn’t know the ages of old objects that scientists find. Thanks to carbon dating we have an approximate age for our Earth. Actually, radio metric dating is how we get both: the age of fossils (using isotopes of C), and the age of Earth (via isotopes with much longer half-lives). Can you make a link between what we’ve said regarding evolution and what we are currently discussing: the molecular nature of inheritance? There exists so many controversies regarding evolution that really makes people doubt about the evidence found backing it up and/or their religious believes. I come from a very religious family where if you just think that there is more science behind evolution, they will take it as a sin. In my opinion, I believe the real truth about evolution lies within the same Earth. Fossils are a great example of this. It is incredible how such a basic component on the Earth surface can say so many things. Any type of fossil a scientist finds gives an approximate time of how old was the organism that was recorded in that fossil. For me, it is very interesting how the Earth by itself keeps track of the years and periods that have gone through evolution. Also, evolution works in favor of animals. Evolution it’s like the home of adaptation. While time is passing, animals start to adapt to changes in order to be more efficient in life. I found very interesting the following article. It talks about the evolution of fish fins. Evolution is truly amazing. It is incredible to see how one single celled organism derived to this amazing environment we have today. I was reading about human evolution and found an interesting article related to acquired traits that we humans have obtained throughout history. This theory was proposed by anthropologist Lynne Isbell from the University of California at Davis. This theory goes back to the time where there were primate mammals and early snakes. As both went through the battle of the fittest, they attempted to escalate through their abilities and characteristics. In order to benefit the early primates, it is believed that they evolved better snake sniffers, while others developed immunities to serpent venom. It is also suggested that they developed better eyesight in order to detect the camouflaged colors that the snakes have. This theory even suggests that because of this acquired trait, the primates, which we descended from, obtained larger brains. Evolution is a theme that has brought many controversies among scientist and people. I think evolution is the most important concept in biology because it has to do with the existence of organisms. I’ve always been very curious of how scientists can determine the age of a fossil or how many years ago that organism existed. The fact of knowing how old is a fossil has made sense to me thanks to this explanation in the video and it is amazing how they determine its age by measuring the amount of carbon that the fossil contains. I had always wondered how scientists came to determine the physical appearance of dinosaurs and other animals who became extinct, but I never considered the fact that mosquitos and other insects could be used as resources for finding the genetic material of these extinct organisms. Radioactive dating also helped me understand how scientists could figure out so much about fossils and their age. There have been so many discoveries, that it makes me wonder how much more will the universe evolve and what can it become in a future. Definitely evolution is one of the fundamental concepts of science that can explain many events that have occurred since the beginning of Earth. A protein sequence from a mosquito specimen 30 million years old can yield a wealth of information that can one day reveal the very nature of the extinction of dinosaurs. Right now, scientists do not have all the answers; but they are getting there. When evolution is mentioned, automatically comes genes and mutations to the conversation. Genetic mutations are originated in the transcription of DNA to mRNA which means that evolution is the result of this biological favorable (in some cases unfavorable) error. These mutations can be advantageous for an organism. Enough repetition and conservation of these mutation means that we’ll have speciation. I other words, genetics proved Darwin’s theory of natural selection. Evolution is the key of life. It is everything in biology. Without evolution our world today wouldn’t exist. The fact that scientists can figure out how old a fossil is impacts me. I found this site that talks about sone fossils. It says that fossil evidence shows that life is old and changed over time. Darwin published his theory of natural selection and created a lot of controversy. Evolution is the unifying force in modern biology, but still nowadays it remains a source of misunderstanding and controversy. Its amazing how from carbon they can figure out the age of a fossil. I find evolution very interesting and fascinating. Evolution is very fascinating in seeing how millions of years humans have evolved up to now. Charles Darwin’s work on evolution created a theory that new species arise naturally by the process of evolution rather than having been created. His work was very important and leads to questions such as how evolution will be in the future. The very foundation of modern Biology can be traced back to Darwin’s observations in the Galápagos. Evolution is basically survival of the fittest, the strongest organisms or the ones that can adapt better are the ones that are going to survive. Every organism had to evolve from something and evolution proves this statement. If we didn’t have evolution, what would have come first? Would we have simply appeared on Earth as babies? How can helpless babies take care of themselves? Without evolution these answers would just be a leap of faith. I found that the Ancient Aliens part of the blog post was intriguing so I decided to research what it was all about. It was actually shocking to me how there are people who firmly believe in the theories that are stated in that series. The Huffington Post explained the basics of the show by stating that “Originally, the concept of ancient aliens, or ancient astronauts, pointed to extraterrestrial intervention occurring thousands of years ago, and possibly even a little genetic intervention as well. The ancient astronaut theory posits that our ancestors experienced these huge leaps forward in advancement of scientific, astronomical, technological and medical knowledge that could simply NOT have happened on their own. We MUST have had some help from above, from entities far more intelligent and evolved than we.” This of course is their way to explain how marvelous and unbelievable historical aspects like the Pyramids happened. I think it is kind of sad how some people devour this “information” just because it’s on television on the History Channel. People should really not assume that just because information is made available to the public through media that it is correct. Darwins theory of evolution by natural selection is one of the best substantiated theories in the history of science, supported by evidence from a wide variety of scientific disciplines, including paleontology, geology, genetics and developmental biology. Natural selection can change a species in small ways, causing a population to change color or size over the course of several generations. Also all the possible good things that natural selection can make it can also make true changes in animals, it can entirely change animals. Evolution is very amazing. Even though there are many people that do not really know about it or even believe in it, is something very important in our lives because it is the real explanation of everything we have or see in nature today. Day by day more people are learning about evolution and expanding their horizons from the religious beliefs of how life started and evolutioned. Evolution. This word alone contains so much history and so much meaning if we think about it. When I hear the word evolution the first thing that comes to my mind is change, but i know that evolution means so much more than that. Evolutions means billions of years of change, modification, improvement, etc. Evolution contains so much meaning that it’s impossible to just explain it to somebody. Evolution is something that is necessary. When i think about evolution i think of improvement. Although i believe sometimes evolution happens to fast and humans cant keep up, it is for the better. Evolution is change, evolution is how we came to be. Theories on the evolution of planet earth or the universe itself may be controversial at times but i believe that in the end evolution is a subject that brings all living things together and everything on earth should and will experience evolution in a way . It amazes me how using technology you can tell the age of rocks that have been lying in the ground for thousands and thousands of years. It is astounding how it has progressed over the years. Using technology we have been able to accomplish so many things. With it we have been able to see organisms that aren’t visible to the naked eye, and without it we wouldn’t have been able to cure diseases as we do now. So many things people once thought were impossible are being done daily with the help of technology. Many of the marks that evolutionary history has left on our bodies are invisible. With time, the human body has evolved in to the actual form it has today. Some organs or other body parts that might have been useful in the past, do not serve an actual purpose in our bodies anymore and are commonly removed (appendix, wisdom teeth). Many unnoticeable traits are legacies of the paths that our ancestors took as they left or stayed in Africa thousands of years ago. However, other attributes of these unique evolutionary histories are perfectly obvious. When people say, “everything in life changes,” they actually speak the truth. Every thing, no matter how insignificant, unimportant, or unnecessary it might be, will change with time. Organisms change to adapt and survive in their corresponding environments, nature and the ecosystems change due to pollution, etc., and nothing ever stays the same for ever. Technology and scientific advancements have allowed humanity to realize the existence of evolution and adaptation, and the fact that we are constantly evolving to better survive in our world is truly fascinating. Reading the quote about Ancient Aliens in this blog post really makes you think and understand better the difference between reality and what we wish was reality. Life, nature, and the universe are very complex “entities” since little is truly given by fact, and were most of the facts can be hard to acknowledge and believe. In such a rapidly evolving and progressing world, many discoveries and facts are published and learned about, but sometimes I think that human’s desires to find something never before seen or understood can affect what they believe in, making them able to trust any explanation or discovery. I know our world is very different and sometimes it can be thought of as weird, but that must never blind us into believing that everything thought of as being weird is true. And this is what the quote mostly emphasizes in, the unbelievable level of absurdity people can reach, which I believe can be very irrational and ridiculous, and reached by them just because they are not able to understand the difference between what is real and what they want to believe is real. When we first discussed the modern debates regarding evolution in class, I was very surprised, mostly because I’d always thought of evolution as a given fact, and it astonished me greatly to hear that some people were not yet convinced by this theory, despite the amount of evidence that has been recorded and heavily discussed throughout the years. The following video explains the Theory of Evolution with more detail, and it definitely helped me clear up any doubts I had left. Evolution is unpredictable, which makes it way more interesting. It is fascinating how species come and go, and evolve to be other species. How they modify to fit their environment, their needs. Who knows for how long us humans will be roaming the face of the Earth, or if we change to adapt to things like global warming, air pollution and our main food sources disappear. This Nat Geo article proposes some ways that we humans may evolve. We are not exempt from the biochemical forces that drive evolution; but we can definitively manipulate how beings evolve, including ourselves. I suggest you research the concept ‘singularity’. It should shed some light on the subject of how human being can take control of their own evolution. The concept ‘bioethics’ should be in your mind when you research this very interesting topic. Much of modern science fiction is exploring singularity. Evolution was necessary for us to become what we are today. Many have tried to dismiss this theory throughout the decades but today it is accepted by almost everyone. Evolution was the answer yesterday, was the answer billions of years ago and is still the answer today because evolution is what keeps the cycle of living organisms running. Even though its hard to believe that we may have come from a organism that is so little that we need a microscope we have accepted it as the truth. If not for evolution we would not be today and for me it is the most important factor in history and science. Radioactive dating has been a very useful tool in many fields; including anthropology, geology, history, etc. A very powerful tool that helps scientists decode the natural history of our planet. It has also been very important in the field of chemistry. Groundbreaking insight on the nature of matter has been a direct result of the use and study of these atomic clocks. Evolution is a natural process that explains how living things change over time. This process occurs everywhere, constantly helping organisms survive all throughout the world. Every day, more and more evidence is discovered that supports the theory of evolution, studied in class and it is fascinating how developed technology helps us every day to determine more details like the one of this post in the age of rocks and fossils. Evolution is the key of life, it is amazing how humans evolved to what we are today. But humans are not the only ones that evolve, technology evolves too. It is amazing how we can tell the age of fossils with radioactive dating. Technology has helped science in a huge way, and sometimes we lose sight of that. Without technology we wouldn’t be where we are today. Radiometric dating is a perfect example of technology used for the advancement of science. Application of basic chemistry to measure how old something is. Seems pretty simple, but its actually a pretty big deal, the fact that we can measure, with considerable accuracy, how old a rock is.